I’m partnering with LOFT to share their huge 50% off sale going on now through Sunday – this draped sleeve blouse that I recently mentioned is part of the sale, and perfect for adding playfulness to your new year outfits! The sleeves come to life once you put it on, and looks chic with either trousers, skinny pants, or a skirt. The subtle puff shoulders with the draped balloon sleeves is on the fashion forward side, but also very wearable. The dot + striped print material is lightweight and machine washable. I steamed it out of the package, but some wrinkles did come back in the sleeves after I wore a fitted coat over it. I also wanted to point out these pull on pants, made with a stretchy, thick textured material and covered elastic waistband. They’re very comfy and will survive a long day of sitting or travel without coming out a crumpled mess! The reviews under “petite” are polarizing, but I gave them a try regardless and would side with the positive ones. They feel like wearing sweatpants, but look like trousers and feature functional front and back pockets. However, as with all LOFT pants, the xxs petite is loose on me and would fit better on someone who usually wears a 0. And since they have lots of stretch, I’d size down if you can. Here’s how LOFT’s signature Marissa trousers compare to the pull on pants. For fit reference I’m 5 feet tall, 95lbs and am wearing 3.5″ heels – both styles would need to be taken in if you’re the same size. Sizing: 00 to 18 petite, also in a Julie fit for curvier ladies with a notable waist-to-hip ratio. Classic trouser pant with zipper and tab waist, belt loops, low-mid rise and a straight leg. Two small front coin pockets and regular back pockets (FYI, all the pockets come stitched shut so you nee to open them up with tiny scissors). The doubleweave fabric version of these pants has a nice weight to it. 00 petite: 13.5″ across waist, 17.5″ across hips, 7.5″ rise, 28.75″ inseam, 8.5″ across leg opening. Stretchy pant with thick stretchy waistband and straight leg. Angled front pockets and regular back pockets. Note a belt will not stay put since there are no loops, but I used some double sided fashion tape for this outfit and you can also add belt loops if desired. XXS petite: 13″ across waistband (stretches), 1.75″ wide waistband, 18″ across hips, 9″ rise, 29.25″ inseam, 8.75″ across leg opening. Compared to the Marissa, these pull on pants have a higher rise, slightly longer inseam, and slightly wider leg. Modern destructed skinny jeans – these have a small waist gap on me in 24 petite, but fit really well in all other aspects from the hips and legs down to the 26.5″ inseam (hits right below my ankles, no cuffing or hemming needed). The distressing is not too much and the knee holes actually hit a tad above where my knees are. Tweed pocket skirt (on extra sale for $32) – Classy work skirt that’s perfect with a cream blouse or a simple black turtleneck. Fully lined with a hint of metallic silver thread in the black and gray tweed weave. Unforutnately, LOFT skirts usually require waist alterations for extra petite ladies. The 00 petite measures 13.5″ across the waist and 17″ across the hips. Boucle dress reviewed in this blog post. Stitchy sweater (on extra sale for $22) – Textured, soft mockneck sweater with gently flaring sleeves. Maritime striped tee – classic tee updated with a mix of narrow and wide stripes. Thank you to LOFT for partnering on this post. Such a pretty look, lovely and presentable for an office look. Just parfait! Been browsing LOFT all day figuring out what to buy lol! Your pictures definitely inspired some new work clothes ideas. Love those pants Jean! They look so comfy and stylish! Obsessed with this outfit! Looks so smart and chic! Hi! I love this outfit, it’s very chic and modern! Can I ask you where you got your belt as well? Thank you for the tips Jean. Really chic outfit – perfect for work. I ended up picking up one of the other items from Loft you recommended… the stitchy sweater. Great reviews. Always lovely to hear from you, Val. Hope you enjoy the stitchy sweater! These are great tips and love the comparison between the two trousers. I don’t own a lot of trousers but it’s good to have options. I like how you styled your trousers. It’s really work worthy and LOFT is one of the best places to shop for workwear items. What belt is that? It looks so nice with your pants. THanks, Linda! It’s a vintage Hermes horsebit belt I found at a secondhand store. Love this look! Those pants are perfect for the office – look like dress pants with the comfort of sweatpants! Thank you for being such a wonderful resource for petite women! Your style has always been superb, and I’ve been a faithful follower for almost a decade now. I appreciate your creativity, warmth, and honesty, although over the years, it feels like the amount of collaborations/partnerships you’ve done has gradually increased to comprise at least one quarter or third of your blog content. I realize you stand by these brands (and you likely would’ve purchased many of the items you feature), but I do feel like I’m being advertised to more and more. Perhaps that’s just the nature of being a fashion/lifestyle blogger these days…Regardless, I hope your blog continues to evolve, and kudos for everything you’ve accomplished! Best wishes and thank you for sharing your life adventures with us! Hi Tiff, I truly appreciate you following along all these years, and for voicing your feedback in such a respectful way. I hear you and know some people don’t want to read sponsored content. I have a “Collaboration” disclosure on the homepage (under the post titles), so you can be aware upfront and choose to skip over sponsored posts. For what it’s worth, I’m very selective with sponsorships (turning down about 90%), and for each branded post I often spend hours assessing pieces for fit and quality before deciding to accept the sponsorship. 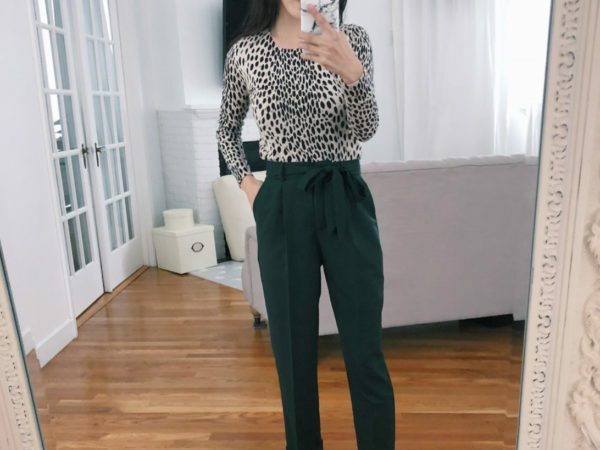 I also try to add value to the post beyond just an outfit post, whether it’s via a comparison of different styles, additional fitting room reviews, or styling tips. Trust is very important to me, so this also means regularly declining sponsorships (even with my favorite brands like Ann Taylor and Nordstrom) when I’m unable to find pieces at the time that I can soundly recommend. On a personal and professional level, I also still find it exciting to team up with brands that I admire. But I understand that’s made possible thanks to the readers of this blog, so thank you again for the kind words and for your support over the good part of a decade! This top is super cute <3 And those pants sound so comfortable! Definitely going to be looking at the sale today! I used to wear Marisa pants all the time. But I really love the pull up style. Thank you for reviewing these! Hi Jean, I bought these black pull on pants from LOFT recently too and loved them as well! I did get them hemmed up as I am about your height but don’t wear heels and commute on public transit and can’t have my pants dragging in puddles. Did you happen to try the herringbone version of the pull on pants? I found them much tighter at the waist for the same size and the legs even looser than the black ones, and didn’t like them, so I returned them, but maybe they would fit better in your size since you felt like the black ones were a bit loose up top. Glad you’re giving the black pull on pants some good press, because the petite reviews were so dismal! I submitted the first good review to even out the score a bit! They are so comfy!! Anyway, I’ve been reading your site for just the last several months or so (just before the baby was born) and I really love your style and the round ups and suggestions you provide for us petite folks!! Thanks for doing what you do. Ah..thank you for the kind words and for leaving that online review! I had been eying them for a while but was so deterred by the 2 one star reviews until reading yours. After trying them I’m pretty confused about why they’re so polarizing (yes they run big, but nothing atypical for LOFT sizing IMO). I’m not in the market for herringbone pants but thank you for the fit tip for anyone who might be!